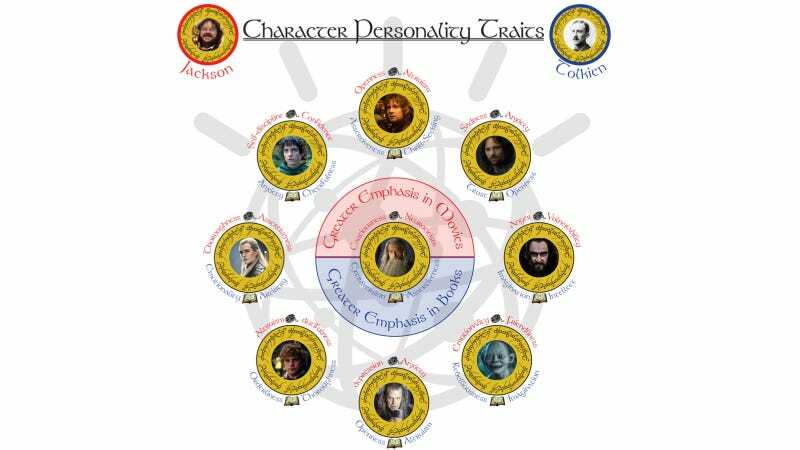 How Do Jackson's Lord of the Rings Characters Compare To Tolkien's? When it comes to personality traits, how does J.R.R. Tolkien's Gandalf compare to Peter Jackson's movie version? An IBM researcher used the company's artificially intelligent Watson computer system to crunch the data and find out. Watson is probably best known for wiping the floor with former Jeopardy! champions Brad Rutter and Ken Jennings during a 2011 title match. But the sophisticated computing system is good at more than gameshows. It's also been used to concoct novel fusion recipes for food trucks, study brain cancer, and, most recently, evaluate the cognitive and social characteristics of Lord of the Rings characters. Readers have noted in the past that book Gandalf is all confidence and power as compared to his film counterpart. Watson confirms that his character was indeed "nerfed" by Jackson: going from book to film, extraversion and assertiveness go down while cautiousness and neuroticism go up. Book Denethor's more regal qualities are diminished in the films, while his moodiness and anxiety is emphasized. Legolas has an artistic, eloquent streak to him in the books. This is muted by Jackson, who prefers a competent and forthright Legolas. Aragorn is indeed less alpha in the films than in the books. In the past, Watson's User Modeling feature has been used to perform linguistic analysis on things like e-mail, text messages, and tweets. Here, the data source is none other than Tolkien's novels, themselves, and the screenplays to five out of six of Peter Jackson's LotR films. "We have easy access to every line of dialog spoken by every character in every book and every film," writes Misra. The Internet is awash with opinions about character traits in Tolkien's books, and even more, it seems, about how faithfully their qualities are reproduced in Jackson's films. Ian McKellen's portrayal of Gandalf, for example, tends to be regarded as more affable than his literary counterpart. What Misra's analysis does is elevate this common observation to a plane of data-driven objectivity seldom encountered in your standard Internet forum. Given a collection of text produced by an individual, Watson User Modeling produces personality scores for each of a few dozen personality "facets." These scores, however, are only meaningful in relation to the personality scores from other individuals… As such, instead of reporting the raw scores, I report the ranking of characters for each personality trait. One handy outcome of this relativistic comparison method is that it accounts for what Misra calls "systemic differences in style of writing between screenplays and novels." For instance, Misra says one general trend is that "characters on film may tend to score higher in extraversion than those on the page." In theory, Misra says, measuring personality facets as a ranking among characters will correct for these systemic differences, along with any differences in style that might emerge when contrasting Tolkien's work with that of Jackson, Guillermo del Toro, Philippa Boyens, and others who contributed to the films' screenplays. Check out the other 12 spectra, more technical details, and the rest of Misra's analysis, here.